Sold Out! That was the headline of many Winnipeg restaurants when last week’s Le Burger Week event came to a close. During this week, September 1-7, restaurant owners and chefs, in Winnipeg respectively, submitted their original, off-the-menu burgers, only available to the public for this limited time. 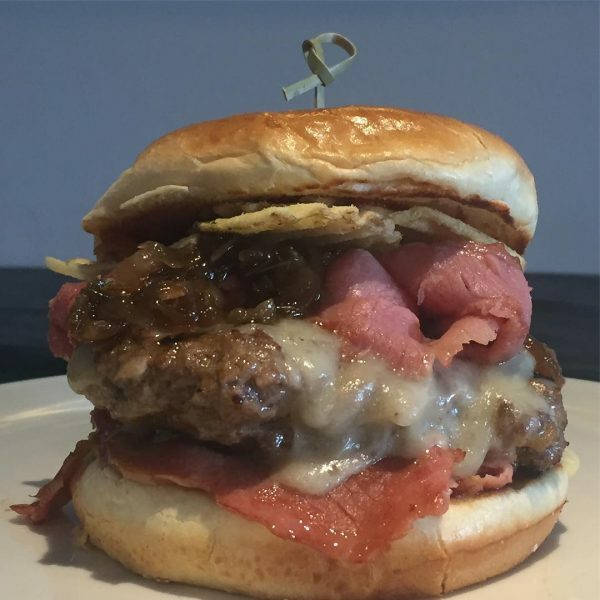 According to leburgerweek.com, more than 100 restaurants submitted their burgers for a chance to be crowned Le Burger Week Champion. There were many interesting burger options, but I’ll focus on the restaurants that used Bothwell Cheese in their creations (I’ll admit, I’m slightly biased). You see, the infamous cheeseburger and I go way back to my teenage years. I used to work part-time at the drive-in restaurant in my home town, “Le Bebe Rouge”. This made-to-order restaurant was known, in my little community, as having the best burgers EVER! I learned from the best and began cooking the (according to my family) best cheeseburgers ever! Needless to say, I love cheeseburgers. I’ll admit, I follow a generally healthy diet, so I rarely indulge in juicy and delicious burgers… except when it’s Le Burger Week. When I do eat burgers, I always put cheese on my burger, it’s a staple at my house. So, when Le Burger Week came along, and participating restaurants announced the use of Bothwell Cheese on their burgers on social media, there was no better time to ‘catch up with an old friend’, so-to-speak. I’ve been to Nuburger before, so I knew that I was in for a treat when they first announced that they were using our cheese in their participating burgers. 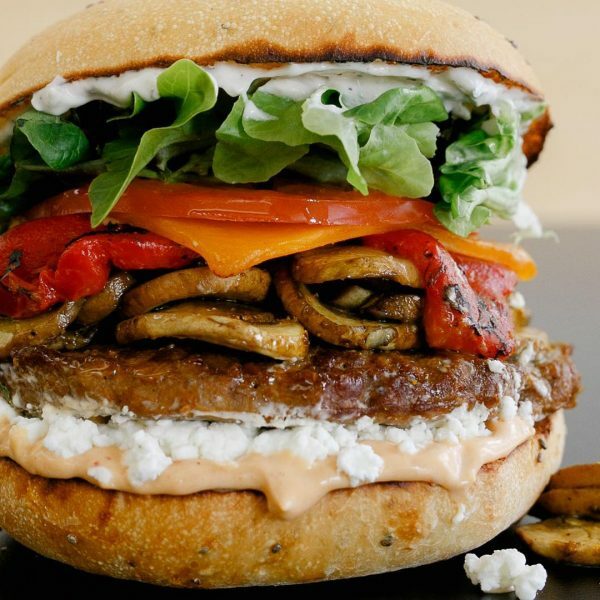 At first, I was skeptical of the flavour combinations – sweet curry sautéed mushrooms, roasted red peppers, goat cheese and Bothwell Cheddar Cheese – but I know that these burger recipes were tried and tested (to perfection) and they were DELICIOUS! 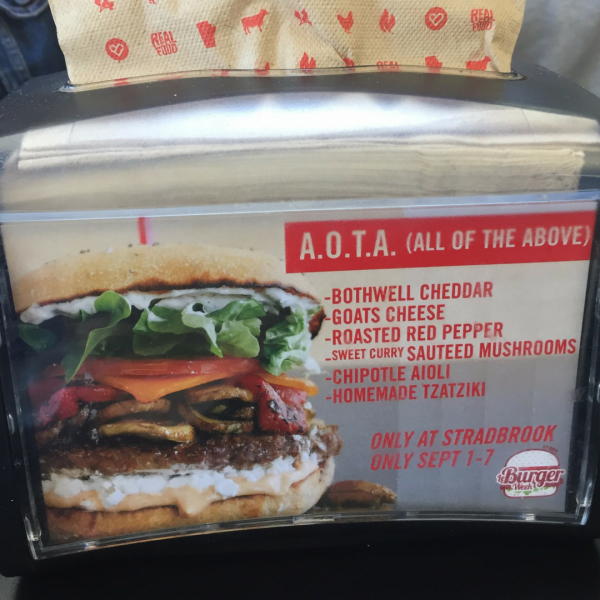 Being a condiment fanatic, I was happy to see that the A.O.T.A. (All Of The Above) (Nuburger Stradbrook) had two of my favorites: Chipotle Aioli and Homemade Tzatziki. It was messy, but the flavour combinations worked so well together. Later that week, I made lunch plans with a friend. He insisted we seek a Le Burger Week contender, and I insisted we go to a restaurant that was using Bothwell Cheese in their burger. He obliged. The next (and last) burger I tried was decided purely on location, based on a middle (ish) ground between both our offices, which happened to be The Oakwood Café. Without even looking at the menu, we ordered their featured burger (obviously), The Big Paddy. I’ll admit, I was unprepared for its size – I could only eat half of it. The large consumption of sweet potato fries might have played a role in my ability to demolish the entire burger. During this visit, I learned that potato chips on burgers are as delicious as it sounds and looks. This burger also included their in-house made beef patty, Guinness sautéed onions, Bushmills Irish Whisky BBQ sauce, gooey melty Bothwell Old Cheddar and corned beef. I would have enjoyed a visit to all of the other Le Burger Week participating restaurants, but with back-to-school creeping up on me, my lunch breaks were consumed with running errands. We did, however, receive an incredible response on social media from other local restaurants who were also using Bothwell Cheese in their Le Burger Week burgers. Check them out below. 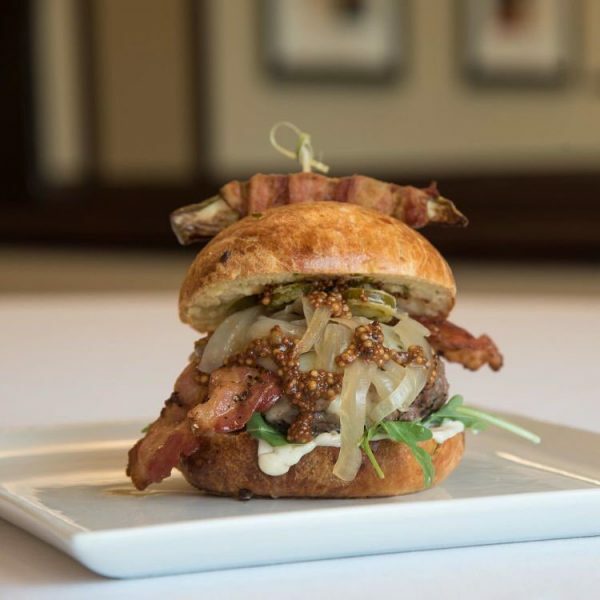 Four Points by Sheraton South – Beer & Bacon Burger. Seven ounces of ground chuck and sausage, Bothwell Cheese Maple Smoked Extra Old Cheddar, double smoked bacon, crispy jalapeños, Farmery Lager braised onions, Smak Dab Chipotle Beer Mustard and bacon mayo on their house-made jalapeño-cheese bun. Mona Lisa Ristorante Italiano – Il Padrino. 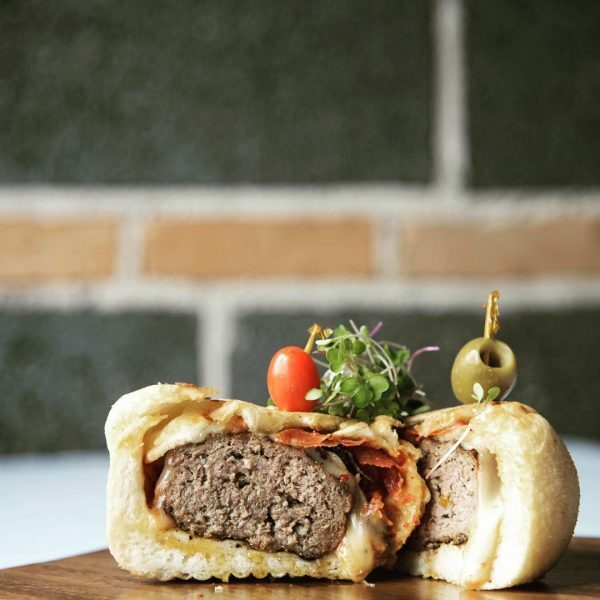 Ground veal patty topped with Bothwell Cheese Jalapeño Monterey Jack, sautéed mushrooms, Calabrese salami, and homemade tomato sauce, wrapped in a specialty pizza dough and then deep fried. Mamamia! Bernstein’s Deli – Oy Vey…What a Burger. Not one, but two 4 oz organic beef patties from Howpark Farms, Bothwell Extra Old Cheddar, grilled corn beef, maple bacon jam, crispy habanero onions, coleslaw, sliced jalapeños, Elman’s pickle and roasted garlic sauce, on a Gunn’s Bakery bun. This burger SOLD OUT. Congratulations! Chew – The Big Max. 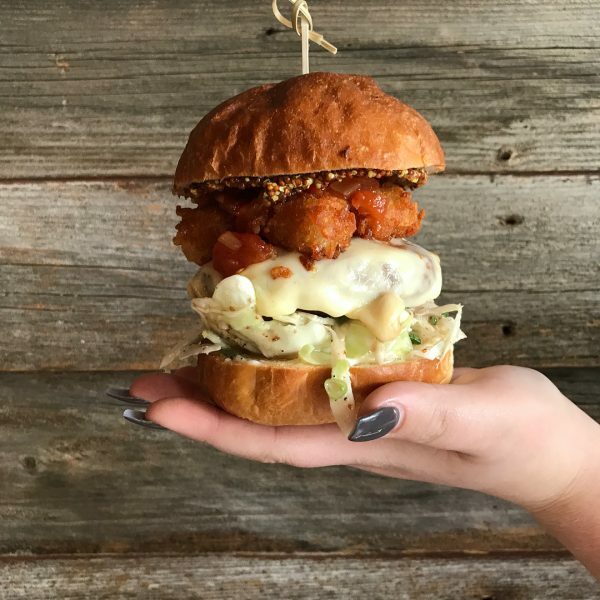 Their beautiful bun stacked with a porcini-dusted chuck burger, Bothwell Cheese Smoked Gouda, tomato chutney, confit garlic aioli, truffled slaw and lemon-y tatertots. Look at that thing! 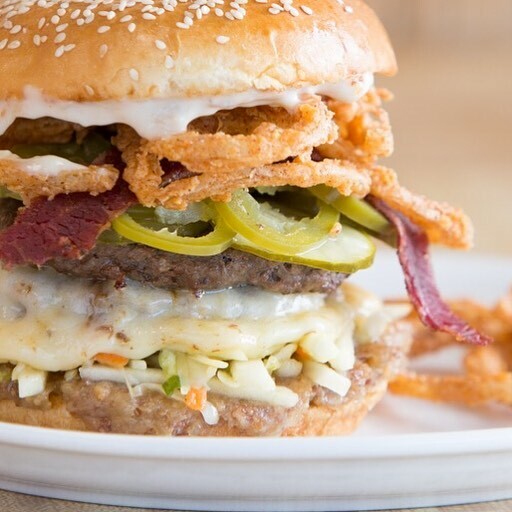 The Nobside Café – The Farmers’ Market Burger. Fresh City Bread pretzel bun, Bothwell Cheese Jalepeño Monterey Jack, Smak Dab Honey Jalapeño Mustard, garlic mayo, juicy all beef burger, farmers sausage, topped with caramelized onions, and banana peppers. This burger featured all Manitoba-made ingredients. 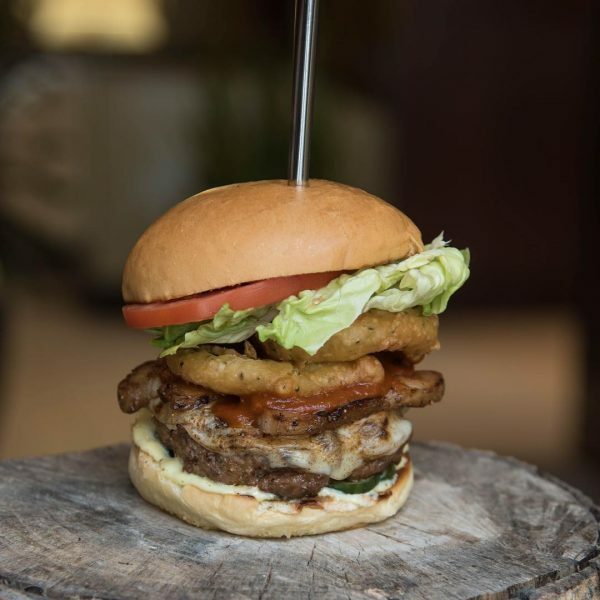 Fairmont Winnipeg – Local 204 Burger. Grilled bison patty, Bothwell Cheese Smoked Gouda, roasted hay mayo, hemp heart crusted onion ring, pickled cucumber, confit peppered pork belly, and Crown Royal BBQ sauce all served on a mouthwatering toasted pain au lait bun. If you’re one of the above-mentioned burger owners, chefs, or creators-extraordinaire – I want to eat your burgers, so… let me know if (or when) they become a part of your menu. 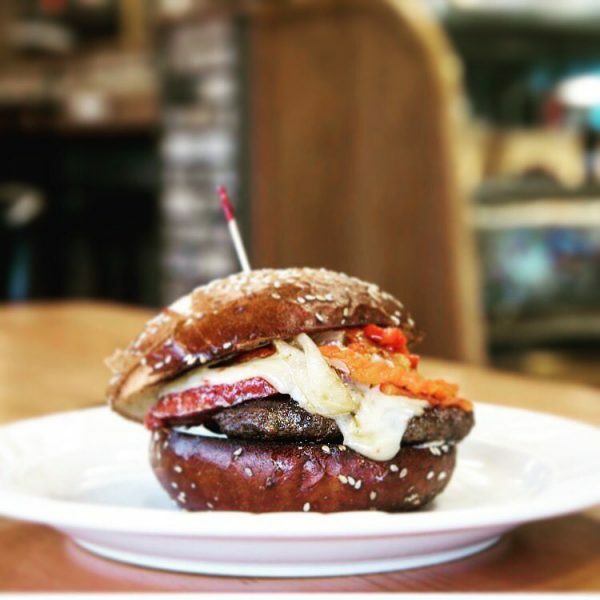 For a list of Le Burger Week winners in Winnipeg, visit leburgerweek.com.